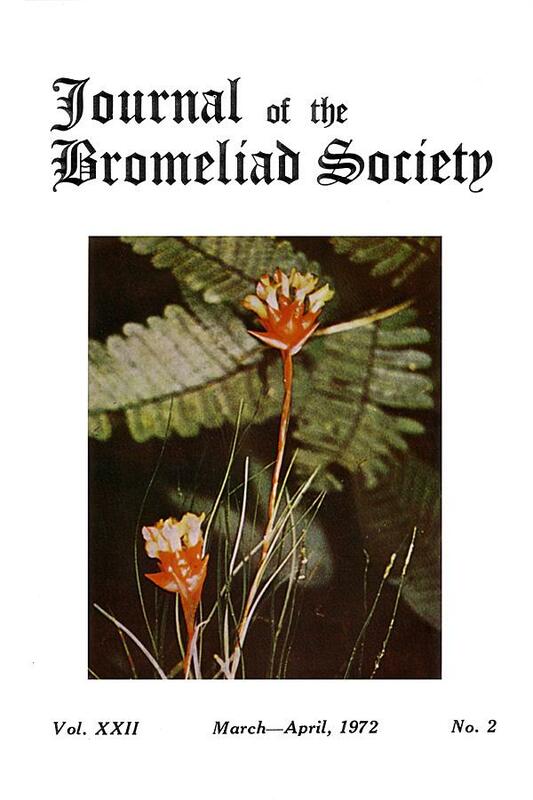 The Journal is the official publication of the Bromeliad Society, a non-profit corporation organized in 1950. Subscription is included in the membership dues. There are six classes of membership: Annual, $7.50; Sustaining, $12.50; Fellowship, $20.00; Commercial, $25.00 and Life, $150.00. P.O. Box 3279, Santa Monica, Calif. 90403. Very seldom seen in cultivation is this small Guzmania with grass-like leaves — Guzmania graminifolia. Photo by Dr. Werner Rauh of Heidelberg. Except for the colorful varieties such as tricolor, viridis, roseus pictus, and beuckeri, all Cryptanthus have a rather poor sales appeal. This ever-present problem has been a challenge to our Rehabilitative Ornamental Horticultural Program for Prison Inmates in Raiford, Florida, where the growing of bromeliads has attracted much interest. We find the highly colorful varieties mentioned above to be rather poor "Pup" producers, which is our main method of reproduction. This is not true with the less colorful varieties; they always produce an abundance of less colorful offshoots. Our experience reveals that stored up in the minds of prison inmates are many latent ideas for solving problems once they are awakened to the challenge. This challenge of small variety bromeliads, together with their hybrids as a "dreg" on the market, is one that caused a number of our inmates some concern. 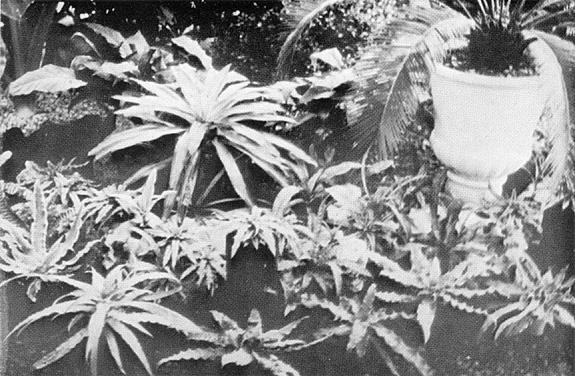 Immediately they attempted various approaches to make use of all kinds—some in conventional dish gardens and terrariums, others in various uses. Although we are not permitted to sell any plant or plant material, we do use all our production for state offices and buildings. Finally one inmate got access to a green 5-inch-diameter pine log with the bark still clinging to it. Laboriously he took a ½-inch wood chisel to a 12-inch-long piece and hollowed out a 2-inch by 8-inch opening, 2 inches deep, in the top of the log piece. Into this depression he placed a good growing mix, then planted an assortment of Cryptanthus — and we were on our way. Later a natural piece of partially eroded driftwood was used which was about the same size and some 15 inches long. The more eroded the ends were, the better they were for our use. This driftwood was much easier to hollow out because it was partially decayed. Now we use an electric drill. Later the planted driftwood idea went upward instead of horizontally, and now both upright and horizontal pieces are used, placed on white gravel in plastic saucers. This facilitates easy watering for indoor decoration. As office plants these "Logs" in all adaptations have really been conversation pieces in every office where they have been used. 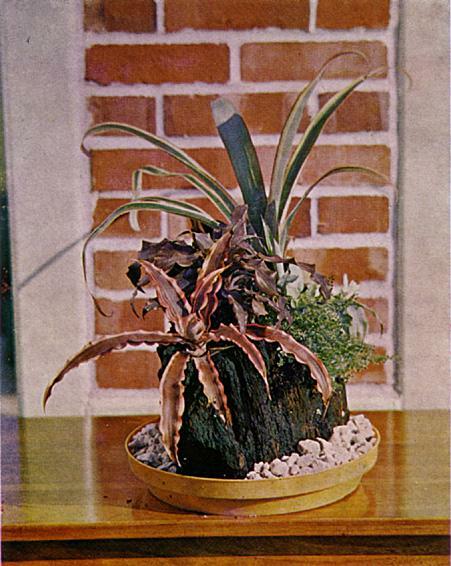 There is no doubt that this idea will revolutionize the demand and sale for bromeliads. Growers can start scrounging for driftwood and pine logs. 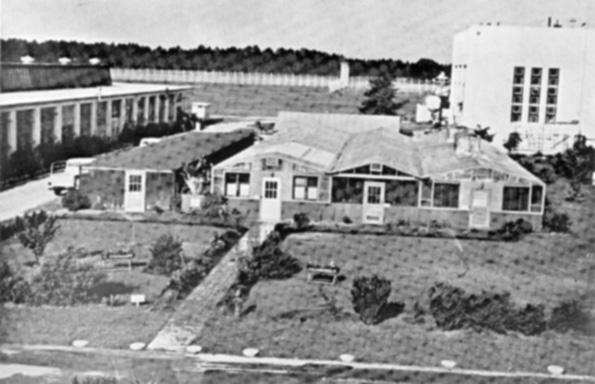 The Florida State Prison Education Department may well be proud of its program in ornamental horticulture which it gives as a means of rehabilitating its inmates. 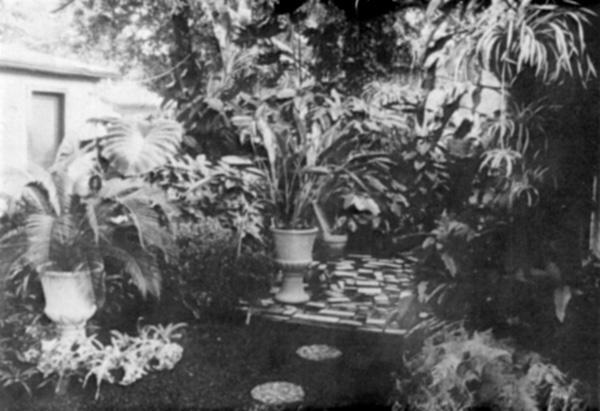 Training attempts to accomplish three major objects: first, to develop in the inmate such personality adjustments as to accomplish the feeling of belonging; second, to train for responsible citizenship, and third, to teach all production skills connected with any type of ornamental horticulture. 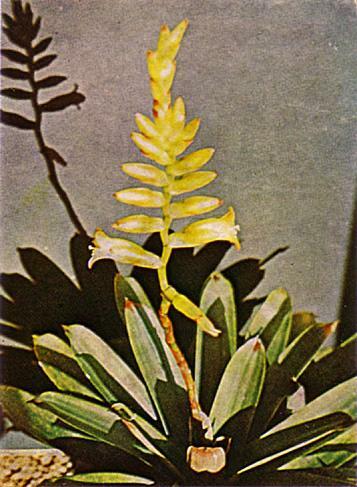 This includes propagation in all its phases of plant reproduction, soils as related to mixtures, potting techniques, cultivation, fertilization, water control, simple landscaping, greenhouse practices, and the growing of orchids and bromeliads among other things. Formal classroom teaching takes place in the morning part of the day with some supervised study from books, bulletins, and magazines. The afternoon is spent with each inmate having a definite area of landscape to develop and maintain. Here he exercises self-expression and develops pride in work well done. Inmates who are trained in some aspect of ornamental horticulture are leaving by parole or expiration and going to nurseries or operating their own nurseries and fully realizing for the first time in their lives that they are wanted, accepted and respected. During the first 10 years of operation this program trained and released 140 inmates. Their experiences included work with over 1200 species of plants—the prison has a total of over 100,000 plants in containers at any one time. During this period only 14 have returned to prison. This is a recidivism rate of 10% whereas the state average is better than 50%. According to Mr. M. B. Jordan, the Bromeliad Society Journal is an eagerly sought after publication among the inmate trainees in ornamental horticulture. They have some 50 varieties of bromeliads and there seems to be an increase in interest as a motivation factor. The Prison could make use of more bromeliad species and hybrids if any of the members are disposed to take or to send such plants. The address is Florida State Prison, P. O. Box 221, Raiford, Florida 32083, in care of M. B. Jordan, Ornamental Horticulture. Such a worthwhile venture as this program should be given every support. Entrance to Gerry Smith's garden, Houston. As all eyes will be focused on the Lone Star State of Texas this year because of the bromeliad show which Bromeliad Society/Houston is staging during the first weekend of June, it is not amiss to devote a part of this issue to the bromeliads the visitor might see there. It is common knowledge that Texas is a big state—big in many ways. For the member who drives to Houston, the bigness of its size will tend to be overwhelming. "The sun has riz, the sun has set, but still we are in Texas yet," is the motorist's lament as he drives through almost endless range country. Then there is the bigness of the Texas pocketbook. Money seems to be no object, for rich oil wells have brought into being an affluent society. The department stores of Houston boast of carrying the most extravagant merchandise in the nation, while the nurseries advertise the rarest and most expensive of bromeliads. Lastly, there is the bigness of the Texas spirit. Exuberance is evident in all that the Texan endeavors to accomplish; everything that he sets out to do is done on a grand scale, befitting the size and wealth of his state. So the members who go to Houston this summer may expect to be entertained in a manner second to none. Texas has just lately entered the bromeliad scene; a half-dozen years ago bromeliads were all but unknown as garden or house plants. Growing bromeliads outdoors in Houston the year round is no mean feat, for the weather tends to gravitate to extremes; in summer, usually a long one, it can be almost unbearably hot, whereas in winter, the thermometer often drops below freezing, and snow is not unknown. Hardly the climate for growing bromeliads you will say, but, again, Texans are not easily discouraged. While there are no large botanic gardens or estates featuring bromeliads, this lack is made up by a goodly number of small private collections featuring the rarest of species and the newest of hybrids. Usually these plants are housed in greenhouses during the winter and brought out in the warm weather to decorate patios and form a jungle-like aspect to the back yard. Following are some of the gardens which have attracted much attention. All are neat and well planned, the result of many hours of thoughtful effort on the part of their owners. Bill Barrett calls his patio-garden "Old Louisiana," probably because he had an old New Orleans patio in mind when he made his plantings. Outstanding is the bromeliad and orchid-covered wall, which gives a warm, truly southern feel to his enclosed garden. The yard is shaded by several large old trees lavishly hung with epiphytes of all kinds. Dixie Harris' backyard garden has as its focal point an outside living room—a patio complete with fountain and shade trees filled with bromeliads. Interesting is her use of Cryptanthus bivittatus growing on moss attached to a bamboo wall. Joe Morrow's contemporary home provides an appropriate setting for the striking silhouettes of many bromeliads. Bromeliads are scattered everywhere throughout the house—even the bathroom has a planter containing Vrieseas and Guzmanias which thrive in the humid atmosphere. Don Rausch has divided his suburban lot into a series of patios, each one different, each one creating the feeling of outdoor rooms. Each is a fascinating place—one resembles a Japanese garden one has a waterfall, one features sunshine for the sun-loving plants. The garden of Jerry Smith has been called "a jungle with the human touch of neatness and arrangement." The entire garden is in an area of approximately 30 by 50 feet,—a small garden, but the ideas and planning incorporated provide an extremely beautiful experience. A stand of tall pin oak trees guards the entrance into the garden which has been cleared to create an open area covered with red crushed lava rock. A carpet of Cryptanthus in a semicircle borders the beginning of lush tropical growth. Among the beautiful Cryptanthus in this arrangement are C. 'It,' C. zonatus and zonatus hybrids, C. racinae, C. fosterianus, C. bahianus, C. bromelioides var. tricolor, and C. lacerdae. All of the Cryptanthus show good color and markings coupled with good form and size. Jerry mists his Cryptanthus and feeds them a mild fertilizer. The filtered light and morning sun bring out many beautiful hues. Cryptanthus growing in Jerry Smith's garden. From this area and to the right is a small multi-colored concrete and porcelain tiled patio. The tropicals on the left immediately catch one's attention. This area harbors ferns, begonias in hanging baskets. Araucaria, Hendera (a variegated variety), and beneath a cluster of pin oak trees, a fern log with multiple species of bromeliads. The "piece de resistance," a ten-foot tall Monstera deliciosa, commonly called split-leaf Philodendron, forms an umbrella above. Texas size would be an understatement! Root-bound in its large container, the plant has sent out aerial roots in search for something to hold on to. The plant has reached such proportions that it is no longer feasible to move it indoors for the winter, so it stays outside and has acclimated to the cold. Hanging baskets of orchids adorn the trees in this area. To the right, splashes of color catch the eye in the form of beautiful crotons, Neoregelia carolinae, and N. carolinae var. tricolor, Nidularium species in varying pinks and reds and Vriesea nova. A statuette of a nymph pouring water from a jug creates a very tranquil setting. In the back of the patio is a bromeliad tree perfectly shaped for its area and artistically arranged with Aechmeas, Billbergias, Tillandsias, and Quesnelias. The tree is about eight feet high with a spread of about seven feet. Spanish moss is used as a filler. Bird of paradise and Anthurium compete with many of the bromeliads for a pleasing effect. On a pin oak tree grows a giant Hohenbergia stellata. The massive plant has been wired to the tree about nine feet up. The tall spike of thistle-like bracts tower a good three feet higher. Jerry is a meticulous gardener, and he has created in a relatively small area a nice tropical effect with bromeliads and other types of jungle plants. To quote Mrs. Olwen Ferris of Australia, "Bromeliads take neglect, but when given attention repay you 100 fold." Tillandsia usneoides is found in over half of the counties in Texas. This is the common Spanish Moss found hanging from tree limbs throughout wooded areas in the vicinity of Houston. Tillandsia recurvata is found in many of the counties of west, southwest, and south Texas. It may be seen growing on telephone wires, walls, rocks, on cacti, in fact on almost any object in a range nearly as great as that of T. usneoides. The common belief is that these little clusters of Ball Moss are the young plants of Spanish Moss, but this plant has roots while Spanish Moss does not. Also the flowers on the Ball Moss appear on stems 3 to 4 inches long, while the tiny transparent green flower of the Spanish Moss is almost stemless and, incidentally, is a more fragrant flower, small as it is. Tillandsia baileyi is found along the Texas coast and a few counties in the southern tips of the state. T. baileyi grows in large clusters so that the shape of the individual plant is not at once obvious. Each plant is a formal rosette with stiff, tapering, concave leaves, gray-green in color with silver dotting beneath; inflorescence with short flattened spikes with green bracts, yellow and red at base, and rich blue-purple petals—some tipped with white. These three Tillandsias have xerophytic qualities far exceeding almost any known succulent even though their bodies are not really fleshy. They, like many of the other Tillandsias, retain the water and absorb nutriment from the air for their food. Of the more than 40 species of this rugged genus to be so far identified, three are native to Texas: H. texensis, H. glomerata, and H. scariosa. They are terrestrials, growing in dry sand-gravel ridges, on dry limestone slopes, on desert hillsides in company with cacti and other succulents. They are true xerophytes, being able to withstand the extremes of Texas climate. Hechtia texensis Wats is found on the limestone bluffs on the Great Bend of the Rio Grande in western Texas. It is a large plant, variable in habit, with very rigid leaves, 1½ feet long, forming a dense rosette. The edges are armed with hooked brown teeth. The 3-foot scape bears a branched inflorescence with white-petaled flowers. Hechtia glomerata Zucc. was first described in 1840. It is native to Texas, Mexico, and Guatemala, where it grows in mountainous regions. It is an old-time favorite because of its ornamental foliage. The glossy, recurved leaves, about 1½ feet long, are armed with long sharp spines and have red and brown markings on their upper side and are silvery-lepidote and distinctly ribbed on their back. Flower spikes, often 2 to 3 to a rosette, are from 1 to 2 feet in height. The inflorescence, a foot in length, is a lax panicle with whitish petals. This species was once known as H. ghiesbreghtii. Hechtia scariosa L. B. Smith occurs in dense patches on rocky hills, dry limestone slopes, and in limestone soil in the southern part of the state along with other succulents. This species differs from the others in that both floral bracts and sepals are deep rose with broad scarious margins. Because of their xerophytic habit and the difficulty in handling them, Hechtias are not often found in cultivation, even in Texas, although H. glomerata has been grown in Houston gardens with some success. It is interesting to note that Indians harvest the blooms from H. glomerata and by some secret process prepare them to eat or chew. The results produce a hallucinatory effect very much like a mild LSD trip. Springtime in Big Bend National Park, an ideal time of the year to see the huge park in bloom, and an unexpected deluge of rain and high water set the background last May for a chance to collect two species of bromeliads rarely found in private collections: Hechtia scariosa and Hechtia texensis. The park, as its name implies, is located on a big bend of the Rio Grande River in Texas and contains several mountain ranges, the highest and most scenic being the Chisos Mountains. Big Bend National Park comprises some 700,000 acres, extending for a distance of approximately 70 miles east and west, and 80 miles south of the nearest Texas town of Marathon. Hechtia scariosa, commonly called False-Agave or lechuguilla, is found on limestone hills near Boquillas in the southwest part of the park. Our plants were collected east of Tornilo Creek about one-half mile off the paved road leading from Panther Junction, on the left. The area is stark and foreboding, hot and desolate. One wonders how anything could grow in such an arid and primitive region. The plants are seldom found singly. Circular or horseshoe-shaped clumps are the rule. We saw no specimens in bloom, but the dry inflorescences were visible on some plants. Those plants located near washes or in depressions where they undoubtedly received more water and where the terrain was richer were greener and larger. The plants are low and the clumps dense. The rosettes are not spread except in instances of individual plants. Because there had been less rain than normal in this particular region, many of the Hechtias were dry, so much so, that the outer leaves especially appeared seared as if by immense heat or fire. They were charcoal in color. Several plants exhibited the yellow and red tinges associated with autumn. Basically, a normal plant is chartreuse in color with a silver-grey underleaf. The recurved spines are red and point in opposite directions. Some plants were dead. Even though the circular or horseshoe shaped clumps are indicative of outward growth, it was observed that this arrangement facilitates the capturing and retaining of water during infrequent rainfall by virtue of the fact that water running down the slope would be trapped in the horseshoe clumps. The dry inflorescences were branched and approximately 2 to 3 feet high. H. scariosa was obtained through the courtesy of the Big Bend Park authorities, since disturbing plant life requires special permission. 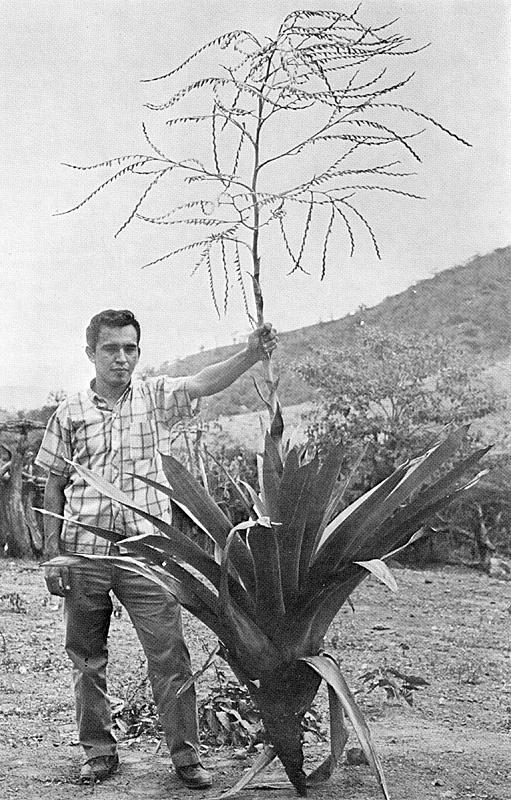 H. texensis was not collected because of the mistaken belief that it would be found near Del Rio. This species, too, is found in Big Bend, but northwest of San Vicente in the Chisos Mountains. Another bromeliad, Tillandsia recurvata (ball moss) we later learned is among the rocks at an altitude of 6,000 to 7,000 feet. This was of singular interest inasmuch as heretofore we believed that the range did not extend this far west. Of all the plants in his greenhouse, the most beautiful was a hanging basket of begonias. The most striking thing about this plant was the medium he incorporated in lining the basket, Tillandsia usneoides. Using Spanish Moss instead of sphagnum moss may not be new to some, but when it comes to saving money, it's a great idea. I have planted Cryptanthus 'Cascade' in a hanging basket, using this Tillandsia to line the basket. When I came to live on Paqueta, situated in the harbor of Rio de Janeiro, last year, I soon saw with regret that bromels are few on the island. Tillandsia stricta, T. tricholepis, T. recurvata, and T. usneoides garnish the trees in profusion, but other members of the family are scarce. On trees also live Aechmea nudicaulis, Billbergia tweedeana, a Vriesea here and there, and perhaps a Neoregelia. The Billbergia also lives on boulders at the seaside. To learn about the island-bromels that I could not identify from a distance, I started by grouping them according to size: large, medium, small. Among the broad-leafed specimens up in trees I noticed a plant whose leaves seemed a little too large to belong to Aechmea nudicaulis. Another unusual trait of this plant is the position of its dry leaves pointing straight down side by side. In a cluster of this bromel growing on a rock I found a dry spike which supported my doubts. The spike is compound and ample and suggests winter-bloom. By the end of August (southern winter) the plants flowered, typical Billbergia style, pale green petals with blue tips. The broad, asymmetric panicle is less common. With these details in mind, but still without material, I tried to find the bromel's name. My first step was a careful re-reading of Dr. L. B. Smith's Billbergia key. I was lucky to find a phrase to suit my plant: "Inflorescence sub-corymbose with lower branches elongate." It pointed to Billbergia tweedeana. This name I looked up in Mr. McWilliams' article in Bulletin, XVIII, 1. There I found a fair description of my plant. 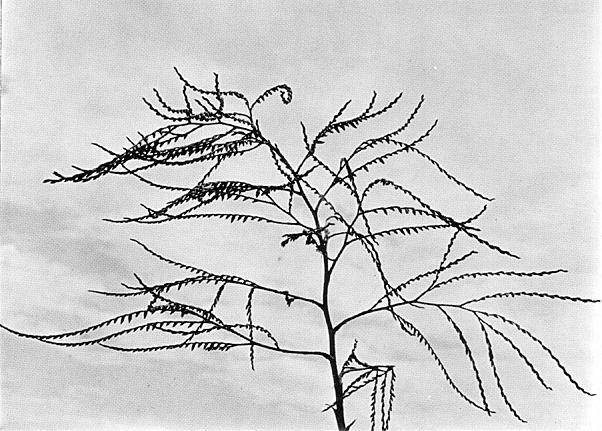 Mr. McWilliams' color photo in Bulletin XVII, 6, taken in the lowlands near Rio, also shows a plant (no name) much like mine (as to its dead leaves) sitting on a heavy branch of an old tree. The next step was to get material. Most of the plants I saw were up in trees. I could see the blue and green flowers and their peculiar twist from below, count them, etc., from a distance. The large clump on the boulder also had flowers. They seemed paler with less blue in the petals than those on trees. Their panicles were larger, to 7 branches against 4 in the smaller plants on trees. The brief flowering period was nearly over. Fortunately, I spotted a spike still in bud on a plant not too far out of reach. I took a look at it again the next day—still buds. Two days later the first flower opened. I tried to cut off the shoot to take it home, but it was much too tough. However, a road sweeper came to my rescue. He frowned at my pocket-knife, used his hands to pull at the tube I pointed out to him and down crashed a large part of the clump. I counted over 20 shoots, 4 of them in spike. I took what I needed. At home I compared my prize with the descriptions—it checked. I had Billbergia tweedeana, the type. The bromel is a large, disheveled aggregation of almost 1 m high shoots located on boulders at the seaside. The assembly of shoots covers several square meters of the rock surface. It has nothing to please the eye. Individual tubes are slender; the young ones are not without grace and beauty. Adults have a few very long leaves rising straight up, some to 1½ m. long. The longest topple despite their stiffness. Blades are 6-8 cm wide, somewhat concave, thick and hard, dark green on the face, slightly banded on the back, with finely serrate margins. I did not find a perfect tip. I did not see the light spots many Billbergias have on the face of their leaves. In the scale design on the underside, I noticed areas of round spots suggestive of the pre-flowering specks in the group. The smaller, older leaves are pointed and spineless. In place of spines they have thin, straw-like margins. The flower scape is totally wrapped in straw-like bracts. They are a pale dirty pink. The panicle-scape is shiny green and arches lightly between the flowers. Its asymmetric pattern spreads in all directions immediately above the mass of leaves. There are up to 7 branches in the panicle, and up to 7 flowers on each branch instead of only 4, as seen up in the trees. The large flowers are sessile and have a fleshy minute green bract. Total flower height is 6,7 cm. Ovary oblong, 19 mm high × 5 mm diam., densely ribbed, dark green. 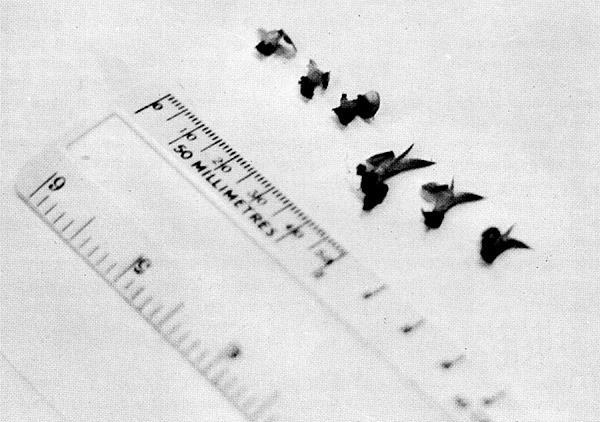 Sepals 19-21 mm long, 3,5 mm broad, pointed, pale. Petals pale green, bluish at the tips, to 51 mm high, lower section 8 mm broad, blade 10 mm, finely veined. The spreading corolla measured about 3,5 an across. Stamens rise up to 7 mm beneath the petal tips. Filaments are curved at tip, anthers 7 mm long, straight, pollen yellow. Stigma slightly higher, has 3 sticky, rounded lobes. First flower to open is the lowest on the terminal branch of the panicle. The open construction of the panicle and the height of the flowers give the floral organs an exposed position. The bromel compound adheres directly to the rock by small, short roots. The striking part of the arrangement is that it seems to function thanks to mechanical interaction of its parts: a number of closely set upright tubes anchored in a grid of very strong stolons. The free sections between shoots on the stolon are no longer than is necessary to permit the tubes to grow up straight supporting one another in the process. New shoots sprout simultaneously in several directions and a new grid is soon established. Worn grids present a peculiar sight. As the leaves dry their blades are crowded out sideways, dissecting in, a straight line some distance above their base. Their final remains stay on the dead stem like a chain of little cups. For a year-round continuance of bloom in your bromeliad collection, this calendar guide may help you choose your next species. It is based on observations made under greenhouse conditions in Florida. On our trip to northern Peru and southern Ecuador in 1970 we found several remarkable new Tillandsias. One of them, T. hildae, has already been published in this journal (Vol. XXI, No. 6). Another very striking species is the new T. marnier-lapostollei, which is named in honor of Julien Marnier-Lapostolle of Cap Ferrat, France, who is one of the world's most enthusiastic collectors of bromeliads and who has in his beautiful garden "Les Cedres" one of the biggest and richest bromeliad collections in the world. T. marnier-lapostollei is one of the big epilithic Tillandsias (when flowering up to 2,5 m high), which grows only on steep, nearly unaccessible rock walls near Macara in southern Ecuador about 5 miles from the Peruvian border at an altitude of 500 m. The plant has a short stem (up to 50 cm long), which produces at its base a number of adventitious plants, this being typical of most of the epilithic Tillandsias. The numerous leaves form an enormous rosette with a height of 1,2 m and a diameter of 1,5 m. Their sheathes are about 25 cm long and 15 cm broad, on the upper side dark brown, beneath lighter brown and adpressed lepidote. The blades are about 1 m long, above the sheath 13 cm broad, ligulate, short attenuate and apiculate; the young leaves are densely white lepidote and nearly glabrous at maturity, on the upper side gray to reddish-green, beneath gray-green with prominent nerves. The erect scape is very stout, 1-1,2 m long, up to 3 cm thick, carmine-red and glabrous. Its bracts are longer than the internodes; the basal-ones subfoliate, the upper ones provided with a broad-ovate acuminate blade—green at the base and dark brownish red in the upper third. The inflorescence is very lax, broader than high (1,2 m long, 1,5 m broad) and normally tripinnate; its rhachis is slightly flexuose, carmine-red and glabrous. The primary branches are horizontally spreading, sometimes decurved and up to 90 cm long. The primary bracts are more shorter than the sterile basis of the branches, 4-2 cm long, broad-ovate, acuminate, green and red spotted. Spikes very lax, many-flowered, up to 50 cm long, with a thin, glabrous carmine-red slender rhachis. Floral bracts fleshy (Prominently nerved when dry), glabrous, green, ecarinate and cucculate, shorter than the sepals. Flowers short and thick petiolated, all secund and curved downwards, 2-2,5 cm long. Sepals free, thick (nerved, when dry), broad-ovate, obtuse, 10-12 mm long, 8-10 cm broad, green, glabrous. Petals narrow, ligulate, blue-violet, longer than the sepals. Stamens and pistil included. Fruits green, up to 2 cm long. T. marnier-lapostollei is related to T. cucculata L. B. Smith, which is known only from Central Ecuador, north of the village Sevilla de Oro, Province Aguay (2700 m), but T. marnier-lapostollei differs from the latter by the larger rosette leaves, the smaller primary bracts (which are shorter than the sterile basis of the branches), the shorter, green (not yellow) floral bracts and the lax (not imbricate) inserated floral bracts. According to our field observations the new T. marnier-lapostollei is restricted in its distribution to a very small area. —Institute of Systematic Botany of the University of Heidelberg, W. Germany. 1) The Latin diagnosis will appear in the papers of the "Akademie der Wissenschaften und der Literatur, Mainz." Three seedlings on left were colchicine treated; those on the right normal. Our experiments with the artificial induction of mutations commenced a few months ago; and as it will be a number of years until final results are known, this article is submitted as a guideline to any members who may wish to follow this branch of plant breeding. Our subject was Dyckia rariflora (being the only brom seeds we possessed) and the treatments used were Colchicine and X-rays. Colchicine is the most common agent used in the artificial induction of polyploidy, or increase in chromosome number, working by inhibiting spindle formation (Blankeslee and Avery, 1937, Nebal and Ruttle 1938). The recognized uses for polyploidy are for overcoming sterility in hybrids, and production of increased size of plants and inflorescence. 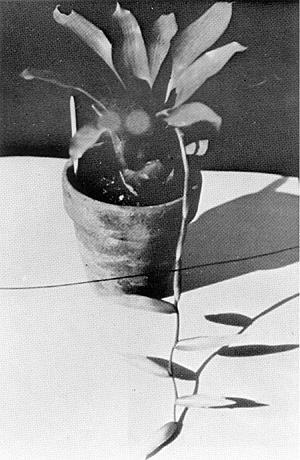 X-rays have a somewhat different effect insofar as they tend to induce mutations affecting the external appearance of one or more characteristics of the plant; thus this treatment is more likely to produce variegations or different coloration and form in the plant than the polyploid effect of colchicine treatment. (Crane and Lawrence, commenting on Baur's experiments with Antirrhinum). Another difference between the two treatments is that, whilst the polyploid effect of colchicine would be noticeable in the Fl (first) generation, the X-ray mutations are practically all recessive, requiring the raising of F2 or even F3 generations to reveal the mutations. In the first batch seeds were soaked in 0.4% solution for 3½ hours at room temperature - 71% germination. After 2 months all of those that germinated have survived, and are generally more bulbous and slower growing than control seedlings. The second batch comprised 16-day-old seedlings soaked in 0.6% solution for 4 hours at room temperature. Two months after treatment, 50% of the seedlings have survived, and exhibit the same swollen, bulbous characteristic as the first batch. Generally speaking, treated seedlings exhibiting "swelling" are roughly 2-3 times the width of the control seedlings and one half the height. Extreme examples are quite grotesque, and circular in shape. First batch received 35 KV, 5 MAS, and 100% germinated. After 14 days they were the victims of an unfortunate accident which will be explained shortly. Second batch received 35 KV, 10 MAS, and 90% germinated. After 6 weeks all seedlings have survived, including 2 albinos which still look hale and hearty in contrast to a number of albino seedlings in the control batch which are all now deceased. These seedlings (which received a massive dose by normal standards — our Government Department of Scientific and Industrial Research recommended a "soft" X-ray of around 5KV) are somewhat variable in size and shape, do not exhibit the pronounced swelling shown by the colchicine-treated seedlings, but seem to be coming along much quicker and are already larger than all the control seedlings, some of which are 5 weeks older. Third batch was placed in an envelope resting on a piece of sponge rubber at a 45° angle approximately 2 mm away from the edge of the field to receive scatter from a dosage of 50 KV, 900 MAS—100% germination. After 14 days all were surviving until our Siamese kitten, Snoopy, sneaked into our hothouse one night when we were giving our broms a final spray before going to bed, leaped up at the bench just managing to get one paw into each of the trays holding the first and third batches of X-rayed seedlings — then Snoopy, trays, and seedlings crashed to the floor. . . . . A couple of hours later all seedlings except 3 had been found, but they were of course all mixed up. Those found are still surviving, the only consolation is that the two batches mixed were those receiving the lighter dosage of radiation. At 6 weeks of age these seedlings appear quite normal, not quite as fast growing as the second batch. The conditions for the experiment were, to start with, somewhat primitive, commencing as they did a short time before our small hothouse was completed. Compost used was a finely sieved mixture of equal parts leaf mould and peat moss, and seeds were germinated in wooden planting trays sealed in polythene bags and placed in the bottom of our radiogram for warmth and darkness. Later, seedlings were transferred to the hothouse where the temperature is held at 21°C, moving air is provided by a muffin fan, and extra light supplied by 40 watt "total daylight" fluorescent tubes (85/15 American Standard). Colchicine treatment was effected by soaking the seeds or seedlings in the solution in milk bottletops, at room temperature. When heat is available this would be preferable, as the effect of the colchicine is directly proportionate to the rate of cell division — I would suggest 27°C during treatment. To you professionals, apologies for my no-doubt amateurish attempt at explaining our experiments and the reasons therefore. We are very enthusiastic with our broms, and would love to hear from any members who have or are interested in, attacking their brom seeds with chemicals, or radiation. Blakeslee A.F. and Avery A.G. "Methods of Inducing Doubling of Chromosomes in Plants by Treating with Colchicine", J. Hered 28: 393-412. Crane M.B. and Lawrence W.J.C. The Genetics of Garden Plants, Macmillan & Co. Ltd. (London). Nebel B.R. and Ruttle M.L. "The Cytological and Genetical Significance of Colchicine." J. Hered 29: 3-9. This is a large, ornamental species, grown chiefly for its handsome foliage. It is epiphytic in the West Indies, Trinidad, Venezuela, and Brazil. Broad, leathery leaves, 2 feet long and 2½ inches broad, form an imposing rosette up to 3 feet in diameter. The bluish-green leaves have faint wavy transverse lines, have purplish shading underneath, and purplish tips. The sturdy, erect, glabrous scape bears a many-flowered, simple inflorescence, a foot long and 3 inches wide. The flowers are large with greenish white or yellow petals. This is a variable plant as to size and coloration. To attain its full beauty, this bromeliad should be grown under warm house conditions. The name means "wide threads" — referring to the broad filament of the stamens. A stump of a plant arrived in a parcel from the late Mrs. Burt labeled Vriesea simplex rubra, and a note suggested that I might like to try it. There were practically no roots on the plant or stump, but I put it in a mixture of peat and volcanic rock (pea size), kept it moist, and hoped for the best. It was not long before a tiny shoot appeared, and from then on it grew steadily. I knew that the plant had a pendent flower stem, so when it was big enough I made a hanging pottery container for it and suspended it from the roof of my shade house where it got dappled sunlight. The color was a lovely ruby shade, and the whole plant was most attractive. Soon a flower spike started in the center and I also found that the roots filled the container. So I transplanted it to a larger pot and placed it high up on a bracket. The flower stem was now above the plant, and before long it became pendent and grew and grew. With the red stem it looked lovely against the ruby of the underside of the leaves. Buds appeared and fattened and added a deep yellow to the overall picture. This is a most attractive plant that anyone with a, space problem could well grow. It is not a large plant, and as it can be in a hanging container it takes little room. In flower or not it is always colorful, and it was a happy day for me when that little stump came into my possession. One of the very few Vrieseas to be found in Mexico is the attractive species pictured above. It is to be found in the lush forests near Cordoba, where it can be found growing on trees. It is a compact rosette of soft leaves, green above and red beneath, measuring about 18 inches in diameter. The plant is variable as to coloring; in some plants the foliage is entirely red. This is also true of the long slender inflorescence. 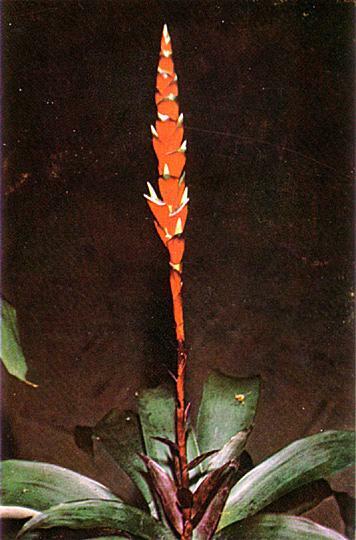 The thin, rounded flower spike, 6 to 10 inches high, rising well above the foliage may have yellow, brown, or bright-red bracts. The stem is bright red; petals are white. Vriesea malzinei, first described in 1874, was named in honor of Omer de Malzine. In most areas it requires greenhouse treatment.